BACKGROUND AND PURPOSE: Endovascular embolization with Onyx is one of the tools used in the treatment of intracerebral AVMs. The recent introduction of a new microcatheter with detachable tip has led us to adopt a new treatment approach by using endovascular embolization with Onyx as the main treatment for brain AVM with curative intent. The purpose of the present study is to evaluate our initial results by using this new treatment strategy with special emphasis on the safety and feasibility of the technique. 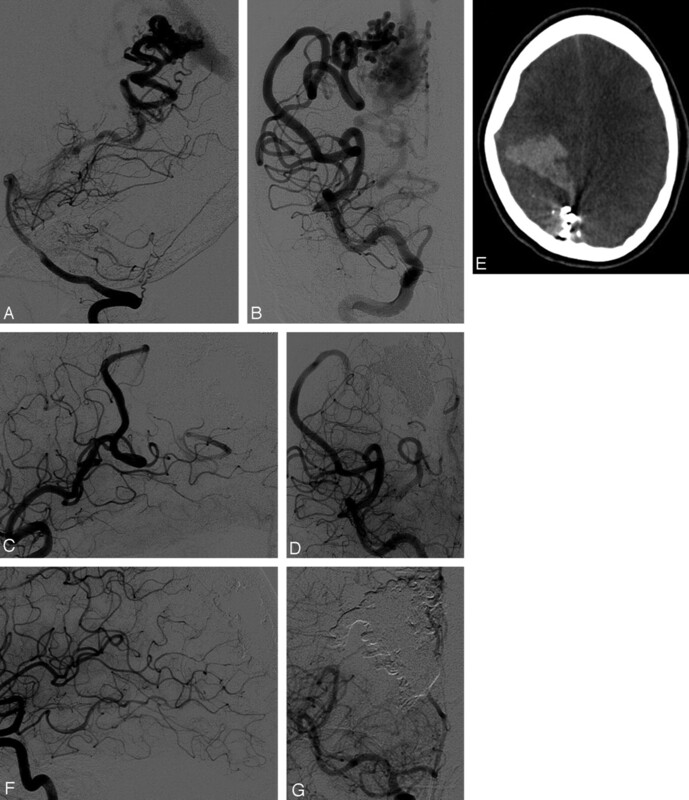 MATERIALS AND METHODS: Forty-three consecutive patients were treated by embolization for brain AVM over a 14-month period, mostly by using Onyx and a microcatheter with detachable tip. Twenty-six of these patients (60%) harbored Spetzler-Martin AVMs of grades 4–5. RESULTS: Endovascular treatments were completed in 29 out of 43 patients; the median number of procedures per patient was 2 (range, 1–4). Complete obliteration by using embolization exclusively was achieved in 16 patients, resulting in a 55% cure rate in patients who concluded treatments (16/29) and 37% in the cohort (16/43). The amount of Onyx injected by using microcatheters with detachable tips was significantly larger than that injected with the nondetachable microcatheters (mean volume, 2.5 ± 2.2 versus 1.7 ± 1.3 mL, respectively, P < .05, t test). Seven clinical complications were observed in a total of 76 embolization sessions (9.2%). CONCLUSIONS: Endovascular embolization of brain AVM by using Onyx and SONIC results in a relatively high complete obliteration. The use of the microcatheter with detachable tip adds several advantages, mainly in that higher volumes of Onyx can be safely injected. Treatment of brain AVMs is aimed at reducing the risk of bleeding by the complete obliteration of the vascular nidus. Until recently, embolization of brain AVMs has been regarded mainly as an adjunct to surgery or radiosurgery as definitive treatments. Due to technical issues, complete obliteration of the nidus by embolization was hard to achieve. Most reported complete embolization rates are ∼10% when using n-BCA as the main embolic material.1–9 The exceptionally high occlusion rate of 40% reported by Valavanis and Yaşargil10 is noteworthy. During the past 2 years we have been using endovascular embolization with Onyx and the SONIC microcatheter as the first and the main line of treatment with a curative goal. The aim of the present study is to report on our recent experience in the first 14 months by using this treatment approach with special emphasis on the safety and feasibility of the technique. During a period of 14 months, between October 1, 2006 and the end of November 2007, 46 patients were admitted to our department for treatment of brain AVMs. Three of them were treated with n-BCA and the other 43 with Onyx. The 43 patients treated with Onyx are the subject of this report. There were 27 (63%) male and 16 (37%) female patients; mean age was 30.5 years (range, 5–69 years). Common presenting symptoms are given in Table 1. Seven patients in this group had been treated in another institute before. It is our policy to delay treatment for 2–3 months after a bleeding episode in most cases to allow absorption of the hematoma. Characteristics of lesions recorded during the first treatment in our institution were used for this report. From the 43 patients, 40 were treated with Onyx only; in 3 patients, a small amount of n-BCA was added for treatment. In most cases MR imaging/MR angiography and/or high-quality CT angiography were used as diagnostic tools for planning the treatment. According to the S-M classification system, 26 out of 43 patients (60%) were graded 4 or 5 with regard to AVMs. The other 17 patients were graded from 1 to 3 (Table 2). Follow-up data on these patients were recorded until August 15, 2008 and are used in the report. Onyx is composed of ethylene-vinyl alcohol copolymer dissolved in DMSO with tantalum powder added (35% w/v) for radiopacity needs. It is supplied in ready-to-use vials in 3 concentrations: 6.0%, 6.5%, and 8%, corresponding to viscosity of 18, 20, and 34 cP. We used Onyx 18 for all of our cases. In 3 cases treated during the initial study period, a small amount of n-BCA was added to the treatment. In 2 cases we used n-BCA to occlude a large high-flow fistula within the nidus. In the third case n-BCA was required to occlude a small remnant that had a short pedicle <15 mm long. No coil or particles were used in any of our cases. We used two types of Onyx-compatible microcatheters: Marathon (ev3, Irvine, California) and SONIC. SONIC is a microcatheter with a detachable tip designed for prolonged Onyx injections in vascular lesions. According to the manufacturer, the detachable tip is connected by glue, which is noncompatible with DMSO and that dissolves upon contact with the DMSO in Onyx (Fig 1). With the SONIC, at the end of the procedure, the tip is detached by gently pulling on the catheter, thus minimizing the risk of the microcatheter being entrapped, or of vessel rupture. The distal part is left in the Onyx reflux cast. With a nondetachable tip microcatheter, the tip has to be pulled out from the cast itself. Schematic drawing of the SONIC detachable tip. 1, Detachable distal part of the microcatheter. 2, Soluble DMSO glue (noncompatible) in the distal part of the connecting zone. 3, Compatible DMSO glue in the proximal part of the connecting zone. 4, Proximal part of the microcatheter. 5, The black line is the second (middle) marker at the detachment point. Reprinted with permission from B.H. The SONIC microcatheter comes in 3 forms: 1.5F/25 mm; 1.2F/15 mm; and 1.2F/25 mm. The first number indicates the diameter of the tip; the second number indicates the length of the detachable segment. It can be used either as a flow-directed catheter or be directed with a guidewire, and it is compatible with both Onyx and n-BCA. Most of the time we used SONIC microcatheters as flow-directed catheters with no guidewire in front. The SONIC has 3 markers on its distal part: one at the distal tip, the second at the detachment point, and the third at 5 mm proximally from the second. The detachable segment is connected by specialized DMSO-degradable material according to the manufacturer. The DMSO in the Onyx inside the microcatheter and around the tip causes slow degradation of the glue in the detachment zone (Fig 1). Onyx does not have to reach the middle marker for detachment to occur. Currently, with increasing experience, we rarely let the Onyx plug fill the whole length of the detachable segment. With glue (n-BCA) the reflux must not reach the middle marker, while with Onyx it must not approach the proximal one. The use of a 15 mm or 25 mm length of detachment segment enables an Onyx plug to form up to 20 or 30 mm, respectively. The Marathon microcatheter is compatible with both Onyx and n-BCA injections. It is stiffer than SONIC and has only one marker in its distal tip. Navigation is usually done with a guidewire in front. Most of the Marathon microcatheters were used during the first 3 months of the study while we introduced the SONIC microcatheter into our practice. After a short learning period, SONIC became our main microcatheter due to its advantages. We now reserve the use of Marathon for special circumstances: short feeders, near 15 mm, where glue injection is an option; due to its stiffness, we also use it in cases where more support is needed, such as in tortuous perforators or some feeders from external carotid artery where the “pushability” of the microcatheter becomes an important feature. All embolization procedures were performed under general anesthesia at the same center under the same conditions by the first author with a monoplane Philips Angio Suite (Philips Medical Systems, Best, the Netherlands). Vascular access was obtained via a transfemoral approach by using a 6F MPC or MPD guiding catheter (Cordis/Johnson & Johnson, Miami Lakes, Florida). Having performed diagnostic angiography to delineate the architecture of the lesions, we immediately proceeded to the treatment itself. In rare cases a separate diagnostic brain angiography session was performed for treatment planning. This was done in a few cases, where the feeders' anatomy was not clear enough from the noninvasive imaging, mainly in small and deep lesions. We did not use systemic heparinization during AVM treatment. Heparin (1000 IU per liter of saline) was only used in the flushing system of the guiding catheter. After the diagnostic part, the microcatheter was navigated to a selected feeder near or into the nidus. It was positioned to achieve optimal Onyx injection, but also into a location where the 2 proximal markers (SONIC) or distal part (Marathon) could be seen during the Onyx injection. Onyx injection was performed according to the plug-creating technique. The idea is to create a hard plug of Onyx around the distal part of the microcatheter. This creates a pseudowedge position, preventing further reflux of the embolizing material and enabling its penetration into the nidal compartments. This technique allows vascular connections to be opened between different compartments and retrogradely to fill other feeders. The plug is created by small injections of Onyx and in-between periods of noninjection. These noninjection periods vary from a few seconds to 2 minutes, and, according to our experience, depend on different factors: vessel size, flow in the area, length of the detachable zone, position of the microcatheter tip relative to the nidus, rate of nidal penetration at the given moment, and stage of nidal closure. Noninjection periods lasting >2 minutes could provoke microcatheter tip occlusion. Onyx is injected in a continuous way or in pulses depending on the stage of the treatment and the penetration rate. If Onyx penetrates well, we inject continuously; when the Onyx cast stops advancing, we start injecting by using small and short pulses until a new path is opened. This is done while paying particular attention to prevent excessive reflux around the distal part of the microcatheter. Onyx injection was interrupted whenever a main venous outlet was reached. We tried to redirect the Onyx to another compartment by waiting for the occluded part to become more solid, creating a higher resistance to flow than nonoccluded compartments nearby. We occlude the proximal draining veins completely at the end of treatment. From our personal experience, and because Onyx is a mechanical occlusion material and not a thrombogenic one like n-BCA, we think this is the best approach to prevent the AVM from reopening. For the same reason we overfill the nidus to prevent flow of blood between the vessel wall and the Onyx. We stopped embolization sessions when the nidus became inaccessible due to the unfavorable anatomy of a feeder and a high risk/benefit ratio for the patient. At that point other options of treatment were taken into account and the patients were sent for other treatments. Those, having small remnants without bleeding, or in a deep or eloquent area, underwent radiosurgery. Others underwent open surgery. Forty-three patients with brain AVMs were treated with Onyx at our institution during a 14-month period. One hundred twenty-four arterial feeders were embolized with Onyx in 76 procedures. Twenty-one patients (49%) underwent 1 treatment session, 12 patients (28%) had 2 sessions, 9 patients (21%) had 3 sessions, and 1 patient (2%) with a giant AVM (S-M grade of 5) underwent 4 sessions. We used the SONIC microcatheter in 93 arterial feeders (75%) and the Marathon microcatheter for the remaining 31 (25%) feeders. The mean and maximum amounts of Onyx injected through a single feeder, by using SONIC microcatheter, were significantly larger than those injected with Marathon (mean volume, 2.5 ± 2.2 versus 1.7 ± 1.3 mL, respectively, P < .05, t test; maximum volume, 10.7 versus 5.6 mL, respectively). Complete occlusion by using embolization only has so far been achieved in 16 out of 43 patients (37%). Three additional patients underwent subsequent surgery (as described below) with complete removal of AVM remnants, resulting in an overall 44% (19/43) cure rate. Fifteen out of 17 patients with S-M grade 1–3 AVMs have concluded endovascular treatments (Table 2; see also a demonstrative case in Fig 2). Complete occlusion by using embolization exclusively was achieved in 11 out of those 15 patients (73%). The median number of treatment sessions in this subgroup was 1 (range, 1–2). In 8 patients complete occlusion was achieved after a single treatment session. Two patients in this group (both with grade 3 AVMs) underwent urgent surgery for hematoma retrieval that developed a few hours after the end of the first Onyx treatment session. One patient was operated on for hematoma evacuation and resection of small remnants. In the second case the nidus was completely occluded during the embolization session, so only the hematoma was taken out. Follow-up angiography 6 months later demonstrated complete occlusion in both cases. One patient with a small inaccessible remnant is planned for elective surgery, and 2 patients were referred for radiosurgery. None of the patients with S-M grades of 1–2 had any bleeding or clinical complications. The remaining 2 patients are planned for further endovascular treatments. Patient with large AVM totally occluded in 1 session with 6.7 mL of Onyx. A, CTA depicting a right parietal AVM with S-M grade of 3. B, Angiography, lateral view of right common carotid artery injection demonstrating the lesion. C, Lateral view of the Onyx cast in the lesion. D, Angiography, lateral view of right carotid injection demonstrating complete occlusion of the lesion at the end of treatment. E and F, Anteroposterior and lateral views of angiography performed 6 months after treatment demonstrating complete obliteration of the lesion. The second subgroup consisted of 26 patients with S-M grade 4–5 AVMs (Table 2). Out of 14 patients who have concluded endovascular treatments, complete occlusion by using embolization only was achieved in 5 patients (36%). The median number of sessions was 2 (range, 2–4). Two patients in this group underwent subsequent elective surgery. Follow-up angiography showed complete occlusion in 1 of them and a minimal residual AVM in the second, which was completely closed during another embolization session. No clinical complications were observed in either of the patients. Seven patients with small inaccessible residual nidus are planned for further treatment with radiosurgery. In all of these patients with S-M grade 4–5 AVMs, the nidus size was reduced to <2.5 cm in maximal diameter, a size compatible for radiosurgery. The remaining 12 patients are scheduled for further endovascular treatment in our institution. During 76 procedures by using 93 SONIC and 31 Marathon catheters we encountered 6 technical complications (7.8% per procedure), with clinical consequences in 1 case. Three cases of complications were linked solely to the SONIC catheter and all occurred during the first 4 months of its use (learning curve period), all with no clinical impact. The distal part near the second marker at the tip of the SONIC is soft. In 2 cases (2.2% per microcatheter) it was perforated at this area when the guidewire was reinserted in an acutely curved vessel structure. In the first case the microcatheter had to be replaced, and in the second case Onyx injection had to be stopped. The third case of SONIC-specific complication was an unintended disconnection of a SONIC catheter at the disconnection point (1.1% per catheter) that occurred while reinserting a guidewire in a tortuous region near the nidus. Other technical complications included 1 guidewire breakage in a distal tortuous branch of the middle meningeal artery and 2 cases where a small amount of contrast extravasation was seen. In both cases it resulted from puncture of a small branch while navigating with a wire in front of the microcatheter. In one case the nidus was inside the right thalamus, which caused sensation problems. The patient later improved but was left with a mild sensation deficit. The second patient did not have any clinical impact from the mild extravasation. In the first case Marathon was used, and in the second case SONIC was used. We had 6 cases of periprocedural bleeding with clinical sequelae (7.8% per procedure, 13.9% of patients). 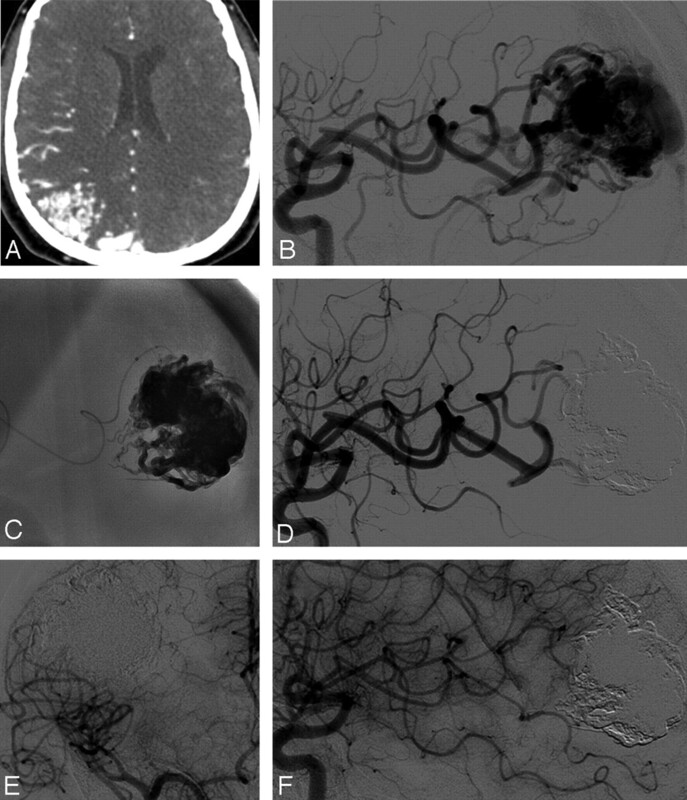 Two patients with S-M grade 3 AVMs had acute intracerebral hemorrhage with mass effect after embolization. Both underwent urgent craniotomy and evacuation of the hematomas. In the first patient the nidus was completely occluded at the end of treatment including the proximal venous side. A day later the patient developed worsening headaches and a small temporal lobe hematoma was discovered at CT. The following day the patient deteriorated, most probably due to seizure. A decision was made not to continue with conservative treatment and to operate only for evacuation of the hematoma without interfering with the occluded AVM nidus. The patient later improved and now has mild short-term memory deficit. The second patient had a remnant at the end of the procedure planned for a second session. He bled from the single feeder that was used for Onyx injection. The injection was performed by using a Marathon catheter. The bleeding was due to arterial damage caused while retrieving the catheter from the Onyx cast. The patient deteriorated immediately after the procedure. He remained severely disabled with hemiparesis. Four patients with mild bleeding were treated conservatively and improved (Table 3 and demonstrative case in Fig 3). Three had intracerebral hemorrhage with no significant mass effect and 1 had mild subarachnoid hemorrhage. All 4 patients were classified as good recovery according to the Glasgow Outcome Scale on clinical follow-up after 3 months. We did not have any case of clinically ischemic complications. Patient with a large right parietal AVM (S-M grade of 3) that developed left hemiparesis after complete embolization of the lesion. Lateral view posterior circulation injection (A) and anteroposterior view of right ICA injection (B) demonstrating the lesion. C and D, Lateral and AP views of the right internal carotid artery injection at the end of the Onyx embolization showing complete occlusion of the arteriovenous malformation. E, Postprocedural CT demonstrating hematoma with mass effect milder than would be expected from the size. The patient was treated conservatively with clinical improvement. F and G, Follow-up angiography 6 months after treatment showing complete obliteration of the AVM. When we recall all of the complications, we had 7 clinical complications (9.2% per procedure, 16.2% of patients; Table 3). Four patients recovered completely in <2 months; 3 patients were left with a permanent deficit (6.9% of patients), 2 with mild (4.6%) deficit and 1 with severe (2.3%) disability. Clinical assessment was performed before and after every treatment and at discharge. Follow-up imaging by using MR imaging plus MRA was performed for most patients before the first follow-up visit between 3 and 9 months after treatment. Of the 19 patients who had complete obliteration of the nidus (16 by embolization only, 3 who were embolized and later operated on), follow-up diagnostic angiography was done in 8 patients, MR imaging plus MRA in 6 other patients, and the rest are planned for control angiography. In the 8 angiography follow-up cases, 7 (87.5%) cases were completely occluded and 1 had a tiny reopening. That case was different from the others. It was treated shortly after bleeding in <3 weeks (see Discussion). In the 6 patients in the MR imaging plus MRA group, 1 patient presented a suspicion for mild remnant/opening. In that case, with no history of bleeding, the AVM was S-M grade 2 with a small feeder from the external carotid artery. The patient is planned for angiography. Only 1 of our 43 patients bled during the follow-up period. It was a woman with a large AVM (S-M grade of 4) with intraventricular bleeding as a presenting symptom for her disease. She bled again, 6 months after radiosurgery, from a small deep remnant that was left after the embolization procedures. She recovered well and was scheduled for surgery to remove that remnant. Despite advances in neurosurgical and endovascular techniques, treatment of brain AVMs remains challenging, often requiring a multidisciplinary approach. In the past 2 years, treatment of brain AVMs in our institution has undergone a conceptual change. We now use embolization as the first treatment option for brain AVMs of all grades for curing, while other treatment modalities are mainly viewed as an auxiliary treatment. This was accomplished due to improvements both in embolic materials and microcatheters, enabling safer and longer injections with higher amounts of embolic material into the AVM nidus. The present work describes our initial experience with Onyx and a microcatheter with detachable tip (SONIC) that brought this change about. Our initial results show that this treatment strategy results in high complete and near complete occlusion rates, with a complication rate of 9.2% per procedure (16.2% of patients), most of which were transient. Until recently, endovascular embolization has been considered mainly as a presurgical or preradiosurgical measure. Most reported complete obliteration rates by using embolization alone in pre-Onyx times were in the 10% range.1–9 Since the introduction of Onyx a few years ago, endovascular treatment of brain AVMs has been reevaluated as a potentially curable technique. Recent published series report a relatively high percentage of cures by using only embolization, especially in selected groups of patients with AVMs grade 1–3. Weber et al13 in a series of 93 patients reported complete occlusion in 19 patients (20%). Van Rooij et al11 in a series of 44 patients reported 7 cases (16%) of complete occlusion by using Onyx only. All of the completely occluded AVMs in that series were grade 1 or 2, resulting in a total occlusion rate of 46.6% in a subgroup of 15 such patients. Mounayer et al19 reported endovascular cure by using Onyx and n-BCA in 26 out of 53 patients (49%). Panagiotopoulos et al20 reported a 24.4% complete occlusion rate. Of notice is a recent report by Katsaridis et al21 on a series of 101 patients treated by embolization with a curative intent. Out of 52 patients who concluded endovascular treatment, complete occlusion by using embolization alone with Onyx was achieved in 28 patients (53.9%). From the whole cohort total obliteration rates were 27.7%. Our results compare favorably with the published series mentioned above. Total occlusion by using only embolization was achieved in 16 out of 29 patients who concluded endovascular treatment, resulting in a 55% cure rate (37% of the cohort). The rest of the patients are awaiting further endovascular treatments with curative intent. Further notice is warranted to the relatively high percentage (60%) of treated patients with high-grade AVMs previously considered untreatable. We were able to treat patients with large AVMs (S-M grades of 4 and 5), achieving complete occlusion in 36% (5/14 of patients who concluded endovascular treatments in this group) by using embolization only, and enabling other treatment options in others. The major advantage of Onyx compared with adhesive embolic materials is the ability to provide slow and controlled delivery over a long interval of time. Injection can be stopped for up to 2 minutes to assess treatment progression and then resumed. This allows for better intranidal penetration and higher obliteration rate of the AVMs. The microcatheter with a detachable tip is specifically designed to take full advantage of the special characteristics of Onyx, allowing practically unlimited injection times. It minimizes the main risks associated with nondetachable tip microcatheters, namely damage to nidus or arterial feeder while retrieving the catheter from the Onyx cast, or alternatively the sticking of the catheter in the cast. When retrieving a nondetachable microcatheter, movement of the Onyx cast can be seen. The risk of vessel rupture increases with a longer plug around the nondetachable catheter tip, in curved arterial feeders, and with long injection times (>50 minutes). One of our patients at the beginning of this study suffered from intracerebral hemorrhage due to this complication. He underwent urgent surgery for evacuation of the hematoma but was left with a disabling deficit. The combined use of Onyx and the SONIC catheter resulted in longer injection times (up to 2 hours from our experience) and a higher volume of Onyx injected per feeder, achieving better nidal penetration while minimizing the risk associated with multiple feeder catheterization. According to our experience, the major factor that influences the obliteration rate with Onyx and SONIC was the accessibility and not the number of feeders. Treatment complications usually associated with the endovascular embolization of AVMs are hemorrhagic or ischemic due to the occlusion of normal perforators. We had no ischemic complications in our series. We think that this is due to the more controllable injection of Onyx and the reflux plug built at the beginning of the procedure. Our main complication was a significant number of periprocedural bleedings (7.9% of procedures). Periprocedural bleeding can be divided into two main groups: navigation-related and bleeding due to the embolization materials. This categorization is useful to better assess and to try and prevent this potentially catastrophic complication. Navigation-related bleedings are usually due to a guidewire puncturing small friable vessels feeding the nidus. Two of our bleeding complications were caused due to guidewire usage. The risk increases with nonflow-directed microcatheters, with which guidewires are nearly a must. SONIC is softer and partially flow directed and sometimes requires guidewire usage, emphasizing the need for development of better flow-directed microcatheters compatible with DMSO and Onyx. In this respect we prefer SONIC to Marathon, still not equaling the classic flow-directed microcatheters such as Magic (Balt). Use of Onyx can lead to specific complications that must be recognized by Onyx users. Onyx injections require high pushing pressure to advance the embolizing material inside the nidus. Onyx-compatible microcatheters can withstand high intraluminal pressure. This “high pressure” injection technique can lead to the tearing of dysplastic vessel walls, with leakage of Onyx outside the nidus, with or without bleeding. We have seen it in 2 of our patients. In the first patient it resulted in a focal subarachnoid hemorrhage and transient clinical deficit. In the second it did not have any clinical effect. If the injection is stopped immediately and time is given to Onyx to precipitate, the bleeding can be prevented. The main reason for periembolization bleeding while using glue is nidal outlet occlusion. From our experience with both glue and Onyx, prevention of this type of bleeding is more complex while using Onyx, due to Onyx properties and the way it is used. When treating large lesions (>3 cm diameter), the cast of Onyx is so attenuated that it becomes a problem to detect where the material is advancing.21 Due to this phenomenon, unwanted filling of venous outlet can happen, which will cause bleeding at the periprocedural period. The larger and more complex in shape the lesion, the more dangerous it becomes. When >7–8 mL of Onyx are injected per session, there is a risk of occluding part of the venous outlet while the lesion is not completely obliterated, thereby changing nidal venous pressure balance and leading to brain edema or leakage from the venous part. This can occur during the treatment or a few hours later. We observed this phenomenon in 2 of our patients who developed venous type of bleeding at the end of the treatment after complete nidal occlusion. The clinical characteristic of venous bleeding is that the mass effect of the hematoma is milder than expected from size, compared with arterial bleeding. In these 2 cases the clinical impact was mild and the patient recovered quickly. One has to keep in mind that part of the Onyx technique involves partial occlusion of compartmental venous outlet, causing the next drop of Onyx to be pushed to a lower resistance area by opening new roads to new compartments.21 Inherent to this technique is the above-mentioned risk of unintentional occlusion of a high percentage of venous outlets. Due to the radio-opacity of Onyx, controlling Onyx injection can become challenging when treating high-volume AVMs. Overcoming this difficulty requires some experience, and we utilize several techniques to control the injection. First, before every Onyx injection we acquire what we call a “zero roadmap” image, which is a road- map image without contrast injection depicting the already in situ present Onyx cast. The digitally subtracted images acquired during later Onyx injection make it easier to detect advancement of Onyx. No doubt, when the nidus is larger and the amount of Onyx is higher, the detection of Onyx becomes more challenging. We acquire zero roadmaps from different positions to get a better 3D understanding of the spread of the embolic material. Second, during treatment we continuously compare the Onyx cast to the pre-embolization super selective and large vessel contrast injection to try and determine which part of the nidus is currently being filled. Third, when we detect Onyx passage from small to larger vessels, it is usually a sign that a vein has been reached. Based on our experience we now try not to inject >6 mL of Onyx per session; however, if this amount is approached and the AVM is almost completely occluded we will continue to achieve complete obliteration. When we analyze our results, 2 possible explanations emerge for the 7.9% rate of periprocedural bleeding. The first is the high percentage of patients with large AVMs (60% S-M grades of 4–5). We did not have any clinical complications in S-M grade 1–2 cases. The second reason could be our intended goal for curing, thereby taking more risks during the endovascular procedures and not “sharing” it with other treatment modalities. When we checked the stability of treatment we found 1 case of documented “reopening” in angiography. That case was different from others. The patient was treated shortly after bleeding (<3 weeks). He had an S-M grade 4 AVM with intracerebral hemorrhage and feeders from external and internal carotid arteries. Due to a weak point in the nidus and his clinical condition, a decision was made for an earlier than usual intervention, without waiting for the absorption of the hematoma before treatment, as we usually do. Another patient presented a suspicion of recanalization on the MRA follow-up. In that case the nidus was fed also by small branches from the external carotid artery. In these 2 cases we were not sure at the end of treatment that the entire venous outlet was obliterated. As we commented earlier, due to the mechanical properties of Onyx, the only way to get complete occlusion of the lesion is to overfill the nidus and venous outlet. With Onyx, we cannot rely on the thrombogenic effect as we can with glue. Currently, we classify a lesion as completely obliterated only when we detect complete filling of the nidus and venous outlet with Onyx and no early venous drainage at the end of treatment. We continue to treat part of the reported group of patients and new ones according to the principles described herein, evaluating endovascular embolization with curative intent as the first and main line of treatment. The introduction of Onyx and the microcatheter with detachable tip enables treatment of large AVMs with a high rate of complete occlusion. The main added value of microcatheters with a detachable tip is the time and confidence conferred to the practitioner during the procedure. We think that the use of microcatheters with detachable tips for Onyx injections can help reduce some of the risks associated with nondetachable microcatheters. Small and low-grade lesions can be cured with a high rate of success and a low rate of morbidity. High-grade lesions can be occluded in at least 36% of cases, while in the rest a significant reduction in size can be achieved, thereby facilitating surgery or radiosurgery. S. Maimon and I. Strauss contributed equally to this work. Accepted after revision October 23, 2009.